New Marie Rochelle and $1.99 Kindle Deals! Now available at Phaze.com! 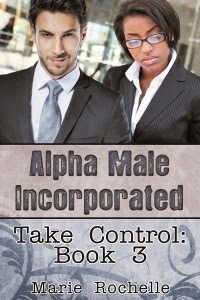 Alpha Male Incorporated fans, are you ready for another hot romance from bestselling author Marie Rochelle? In Take Control, Book 3 in this sizzling series, we get Raya's story. As Sahara's best friend, Raya gets to know the vampires of AMI but doubts she could mate with one for life. Thorsten, on realizing Raya is his chosen, sets out to convince her otherwise, but she blocks him at every turn. What will it take to change her mind? Preview Take Control and order now at Phaze.com! Add this book to your Goodreads TBR! Coming soon to Amazon, BN, and ARe! Dreams, appetites, instincts...it's all on sale at Kindle for a limited time. Come Sunday these books go back to regular price so don't miss out on this sale! All My Dreams by Jennifer Mueller (M/F): Loryn runs to Majorca to hide from life and love, but they find her anyway in the form of a handsome film director. All the Fixin' by Marie Rochelle (M/F): Craig believes Shea stole his family legacy and potential fortune. Will she take his heart as well? An Appetite For Seduction by Paige Bennett (M/F): It's getting hot in the kitchen, where Quinn and Jameka are "cooking" up quite a storm! Aneshu by L.E. Bryce (M/M): The exotic Aneshu entertains and enthralls as one of Tajhaan's celebrated actors. An encounter with a nobleman will change his life. Animal Instincts by Brenna Lyons (99 cents! ): Mattayas and Anha come from two different packs, yet can't ignore their attraction. Will it bond them or tear them apart? Daily Deals at All Romance! Every day we add a new deal to All Romance eBooks. Visit the Phaze catalog at ARe today and grab a hot bargain. Don't forget to follow us on Twitter @PhazeRomance!